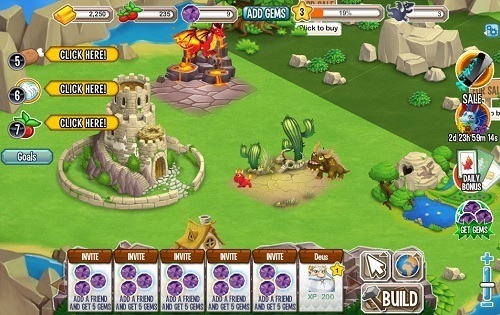 Dragon City was released in 2012 for Facebook and eventually made its way to the iOS and Android platform in 2013 (which is completely linked to the Facebook version). 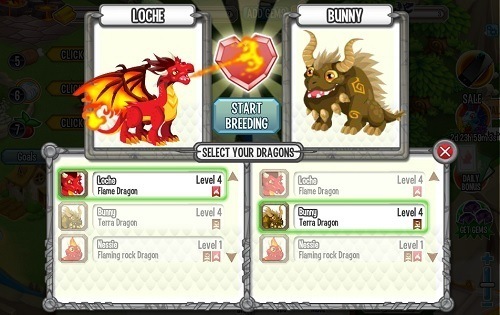 The game has you creating your own magical city of dragons by breeding them to discover all the available species. To prove that you are a true Dragon Master you’ll have to breed, feed and train your dragons to become the ultimate warriors. Once you are certain you’ve got an unbeatable dragon team you can take them to the online environment to battle against other players. The game is constantly adding new dragons for players to unlock and currently has well over 100. Of course some of these dragons are easy to obtain but others require careful breeding if you are ever going to be able to add them to your team. The journey to become the ultimate dragon collector is a goal for many players while others simply focus on creating the strongest team possible to battle against others in the multiplayer environment. These objectives are somewhat linked since the rarer and harder to achieve dragons definitely have strengths over the common ones. You won’t be without guidance though regardless of what you choose to pursue in Dragon City thanks to the hundreds of goals that the game has built in to help guide your gameplay and give you a sense of achievement on a constant basis. The game isn’t just a monster focused experience though and allows you to decorate your own city while you wait for your next dragon to hatch. With a good amount of freedom over buildings, farms and decorations you’ll be able to create something unique very easily. Overall you’ll find Dragon City to be well paced in how it unlocks content and there is plenty of end game with the multiplayer battle options. You might not have ever dreamed that you’d be breeding dragons but once you get the hang of it you’ll enjoy planning out your path towards the rarest dragons and a real sense of accomplishment when they hatch from their egg. Breed your own dragons for battle. Fight online against countless opponents to prove yourself as a master. Build your own Dragon City. Available on Facebook or iOS/Android devices (same game server). 100s of dragons and goals to strive for.